The one thing everyone wants to know about cats…. It seems like every few weeks, I’m looking at the calendar to confirm a suspicion. My cats are still pretty young and active, but some nights they seem a bit more frisky than others. This usually involves a lot of puffed tails (known as piloerection), dilated pupils, howling meows, and racing around the apartment, often skidding around in a 360° spin. My suspicion? That this behavior increases during the full moon. Although I haven’t attempted to officially track it, it appears as though their wacky behaviors correlate to the full moon. Of course, it could be that I am more likely to check the calendar when I’m aware the moon is full, and ignore the behavior on other nights. Or perhaps my own behavior changes around the full moon, which causes my cats to act differently. So, I thought I would do a little research. It appears that the evidence is inconclusive — does the full moon affect our behavior? Some studies say maybe, others say no. One study (Wells, R.J., Gionfriddo, J.R., Hackett, T.B., & Radecki, S.V. (2007). Canine and feline emergency room visits and the lunar cycle: 11,940 cases. Journal of the American Veterinary Medical Associatio, 231, 251-253) found an increase in emergency room visits for pet cats and dogs during the full moon. One thought is that the increased moonlight allows for greater activity. Tell that to my indoor cats who don’t spend much time in direct moonlight! Without more proof, it’s hard to say the full moon is in fact causing this frisky behavior. So, next time I’ll just enjoy their excitement and try an extra play session with a feather wand! Perhaps more research will help us learn about whether Feline Full Moon Fever is real, and in the meantime, feel free to share your cat’s full moon antics with us. There were even hits to our website from searches for things like “will rambunctious kittens ever grow into couch potatoes” (maybe), “feline kneading while dragging rear end” (sounds like a trip to the vet is needed), “cat behavior study science tin foil” (I’d like to hear more about THAT study), “can i make a living being a certified cat consultant” (hahaha, maybe), “his teeth with turkey” (??? ), “two cats in love” (is it really love? ), “cat safety and qtips” (hmm), “masturbating edge of blanket” (not sure if this is about cats or not), “cat dressed as dragon” (don’t torture your cats! ), and “maximum extreme behavior in my cat” (whoa). 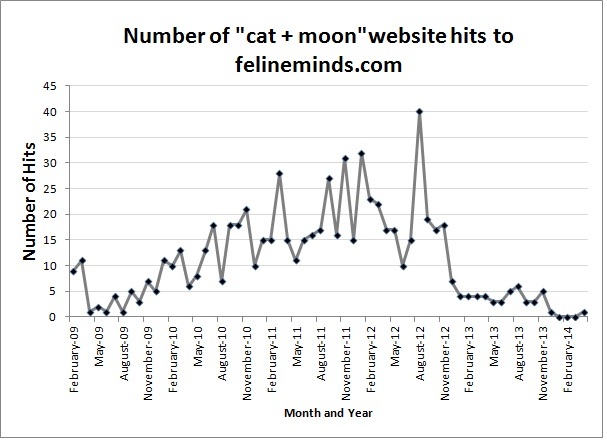 But what struck me as odd was the number of hits our website got about cats and the full moon! “Can a full moon cause cats to act weird?,” “cat climbing during full moon,” “cat more frisky during full moon?,” “cat has behavioral changes around full moon,” “violent behaviour full moon polydactylism(??? ),” “why do my cats meow during a full moon,” “cats freaked out full moon,” “a lot cats (sic) sitting together outside under full moon,” “cat behavior super moon,” “my cat is bad during a full moon,” and “my cat raced around during moon change,” just to give a handful of the hundreds of examples. Over the course of just over five years, we got over 700 hits from full moon + cat searches! These hits peaked in August of 2012, and have decreased somewhat since. I admit this is nothing resembling a scientific study…but anecdotally, it seems like this is a burning question for many cat folks out there! I even checked Google Trends to see what they had to say. For “cat/cats full moon,” all of the searches originated in the United States, and there were plenty of inquiries. It’s not like this is BLOWING UP the internet, but I’d say there are enough questions out there that people HAVE TO KNOW: Is the full moon impacting our cats’ behavior? I could imagine a citizen science study!!! Perhaps people log their cat’s behavior with a detailed ethogram each day, and this could be tracked in a massive database and correlated with phases of the moon. Sound like a project you want to get involved with? Let's talk (mikel at felineminds dot com)! Oh, and let me know if you think your cat gets crazy around the full moon. 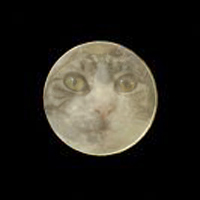 Our cats go crazy during full moon, and during new moons too. Behavior includes running around, acting crazy, serious meowing, trying to mate (one is a boy and one a girl), pawing at things, having puffed fur and dilated pupils, carrying toys around the house to excess, getting into cupboards...and more. Then there is quiet until a next full or new moon....then crazy happens again. We track it. The male is much more affected. In fact we are at new moon now which inspired me to write this. My two cats are 2 yr old males (brothers) 9 times out of 10 they are fine, the odd fight but nothing serious...until 2 days before, during and sometimes 2 days after the full moon! They go crazy, racing around, fighting, one cat races about the garden yelping...very odd! I thought it was just me imagining things but i've kept tabs on their behaviour and it is always on or around a full moon! They really do turn into 'luna'tics! 🙂 Good to know im not the only one experiencing this and glad to find this post! My boys are Aphrodite Cats as we are in Cyprus. Hello. Just dropping by during a full moon to find out why my cat goes crazy during a full moon. She's a black cat too, so extra spooky! She has been so unsettled tonight and must have been in and out of the house 10 times within 5 hours. She is fine, just 20 years old and obviously suffering from full moon fever. Thanks for the anecdotal post! Put me in your study.